The other day I had to get up at a silly hour to catch an early flight and rather trust to luck waking in time, found my old Vibralite 3 alarm watch, set the alarm and was rewarded with a vibrating wrist at 5am. And this got me to thinking – What a coincidence as I’m looking to update/replace my old Casio digital as well as the Vibralite. Now I can kill two birds at the same time and try source a replacement. As before I’ll concentrate on SIZE and CLARITY plus this time a VIBRATION alarm. Why vibration? I can’t hear the little beeps watches have as alarms – but vibrations no problem. So what I need is – A maximum 45mm diameter x 15mm depth and preferably under both figures. And this time I don’t rule out a digital display as long as I can read it! 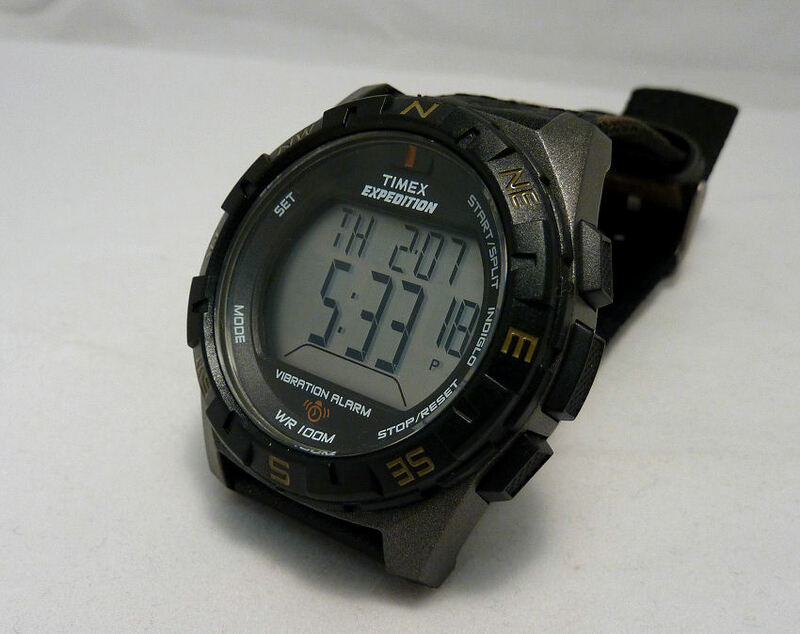 And in the event it wasn’t too difficult and I found this Timex Expedition Vibration Alarm Chronograph – Model T49854J. Good looking adventure outdoor style watch with grey/green colored resin case with black bezel and a green/black nylon fabric strap with flat grey metal buckle. Excellent clarity digital display under a Sapphire crystal, with black numerals on grey/green background with good contrast and size. At 48gms this model is VERY light indeed and the watch case at 45mm diameter (including buttons) and 15mm depth is just on the size limits for me, but OK. The strap is a neat thin and flexible nylon dual layered fabric type with “melt” sealed holes to prevent fraying. Unlike many Casio style watches that often have special strap fittings, this has a standard 22mm width strap fixing to standard watch lugs. A very good feature in my opinion. The buckle is nicely profiled in that it lies flat and flush against the strap – one of the neatest I’ve seen. Two good size push buttons on the left for “Set/Done” and “Mode/Next” and on the right 3 push buttons. Center one (largest) is the Indiglo nightlight, which is really quite good and the other two for “Start/Split” for Chronograph and “Stop/Reset” – all pretty straight forward. The back is a 4 screwed stainless steel back with a Water resistance to 330ft or 100m, so swimming pools OK, but No scuba diving. (if confused – see HERE). On the wrist it’s very good though size wise right on my maximum and it feels light and very comfortable. 45mm (incl buttons) x 15mm still fits my small 170mm wrist though any bigger? The excellent display shows in normal view the Time as Hours, Minutes, Seconds, Day of the week, Month and Date. It also shows if any Alarm is set – so pretty comprehensive. I like the fact the Hours & Minutes figures are around 9mm high, which makes them very easy to see even at 6 or 7 feet away (I use a very scientific test – I get in the bath in the evening, the watch is on the window ledge some 7 feet away – if I can read it – it’s a PASS!). This one is 10 out of 10! Easy view display with large numbers. Time functions are as stated above and you can set 12/24hr indication, the order of month/date to suit (excellent for UK users), 3 Time Zones, Chronograph 100hr with split, laps with numbering etc, 3 Alarms, Hydration Alarm plus an odd set of “occasion” alarms with preset descriptions such as Birthday etc. Plus a Count Down timer. Alarm settings have various options such as Daily, Week Days or Weekends. The Timer has an option to either stop after it’s alarm goes or to reset and start again – a useful option. Another nice touch is that once a Timer has started, say for 30 minutes, just above the countdown, the original time period 30 is shown. I also notice that on my wake up call Alarm I can set options to Vibration, followed by Beep and a flashing the Indiglo lit dial. (note it will only beep on the Timer setting, which in fairness is OK as the watch is advertised as an ALARM vibration model ). Also this advanced Indiglo feature includes a clever night-mode feature and when set, any button will activate the night light. As the watch name indicates, Alarms can be set to vibrate and/or beep. Oddly the instructions don’t cover this setting (and some others) though in reality it’s quite simple. By the way the instructions come hidden in the base of the plastic holder the watch is mounted on within the box supplied – it is very easily missed in the excitement of getting your new watch! It’s basically a continuation of the initial “time” setting. With Time display showing, press SET/DONE button (top left) until it shows HOLD, then you can let it go, then follow the instructions by pressing MODE/NEXT (bottom left) to view all the settable options in turn – such as the Hour, Minutes, Seconds, Month, Day, Year. Now the Instructions appear to stop at the Year, then they vaguely mention further Options. – Well just keep pressing MODE/NEXT button and these extra options will show. Each press on the MODE/NEXT push button shows yet another Option, like 12/24hr option and Month/Date format (I always change this to the more familiar UK option of Day/Month), then Vibration/Combo/Beep, Hourly Chime, Button Beep and so on. Actually it’s quite intuitive. Once you get to the option you wish to set or change, simply press one of the upper or lower right hand pushers to up or down or change format to suit (ignore the center right button, it’s purely for the Indiglo light). After setting or changing any option simply press the SET/DONE button again and that’s it. And it’s not only the Vibration alarm that is missing from the instructions, there a quite a few other options available for customization. So as said, super simple – once you’re into the setting mode, simply press Mode/Next to go through the quite long list of options, setting times, dates and things and those other settable options along the way. Actually one of the things I DO like about this watch is the ease of setting and operating any of the functions. It is both intuitive and quick – a point other Makers should maybe try and emulate. 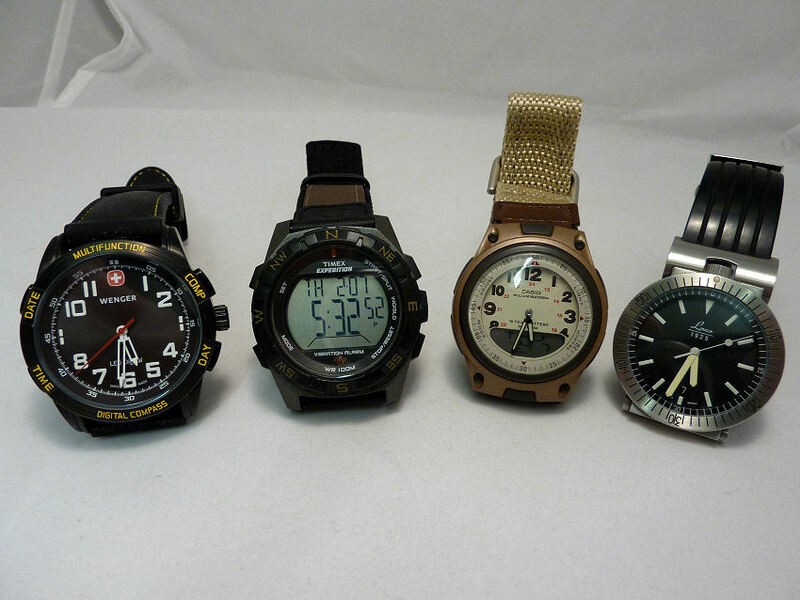 Looking at this model in comparison cosmetically with other watches it looks pretty good – here shown against the old Casio on the center right – and my reason for updating in the first place, it does show how watches in general have grown in size today. 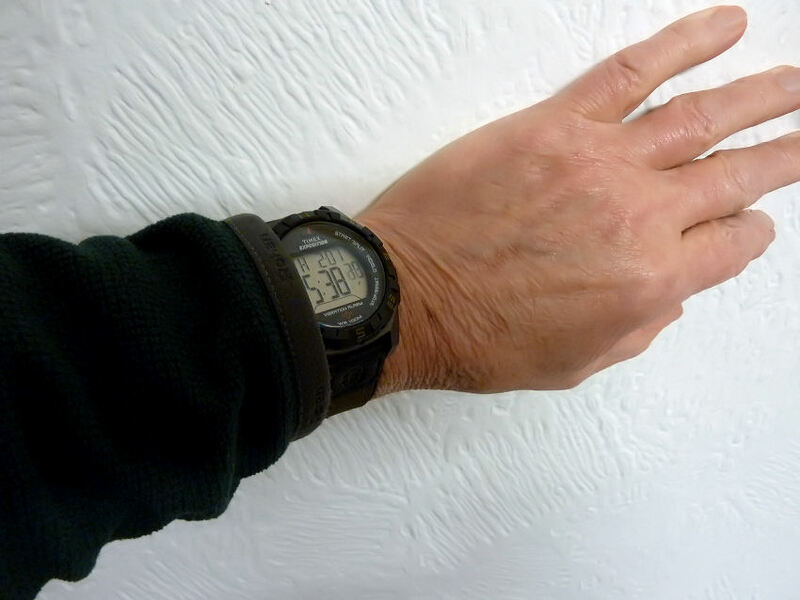 This image also illustrates that this particular digital display on the Timex is very clear and certainly as easy to read as an analogue. Good clear display, shows well against others. So in conclusion I have to admit to being very pleased with this Timex. So far it’s all pros with this model, though time will tell no doubt. But I think they’ve got the display just about right – it is large, clear and easy to read and a big improvement on many of the digital display watches I’ve seen in my trawl of alternatives. The menu system is intuitive in that the “Set” button means just that – from there you can set everything. The push buttons are large and easy to use and don’t appear to get pushed accidentally either. It’s comfortable to wear and you can get it wet without worries – and you can see it at night. I personally like this version with the muted green/black color scheme and I DO like the conventional strap and fitting, something that Casio and many others making ABC watches would be well advised to take note of. This business of “special straps & bracelet fittings” is a nonsense and in my view a cynical little after sales money spinner. 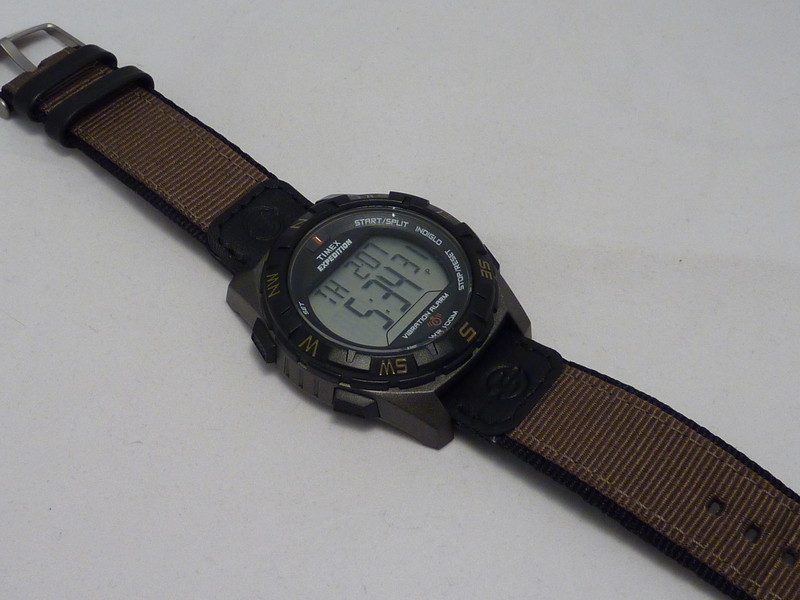 But in this case full marks to Timex, when this one does wear or fray eventually and in my experience this type usually do, sooner or later, it’s a simple matter to replace it with a strap of your choice. The battery is a a standard CR2032 and it’s even stamped on the watch back as a reminder. The Timex T49854J does what it says very well, simply and at low cost – it is not an expensive watch – perhaps a lesson for some others out there. In essence a VERY practical watch and good to wear.